North Korean soldiers have detained two female US journalists on the China-North Korea border, media reports say. The journalists had apparently ignored warnings to stop filming in the area. The US has expressed "concern" over the fate of the two women. Pyongyang has yet to comment on the incident, and China says it is investigating. The reports come amid heightened tensions between North Korea and the US over the North's plans to launch a satellite into space. The North says the launch is part of its communications programme, but the US fears this is a cover for testing long-range missile technology. According to the Associated Press news agency, Laura Ling, a Chinese-American, and Euna Lee, a Korean-American - both of whom work for the California-based online media outlet Current TV - were arrested late on Tuesday. Their Chinese guide, an ethnic Korean, was also detained, the agency says. Chun Ki-won, a Christian clergyman in Seoul who helped arrange the journalists' trip, told reporters they went to the area to report on North Korean refugees in north-eastern China. There is still some confusion as to exactly where the reporters were arrested. South Korean television station YTN and unnamed diplomatic sources said that North Korean guards crossed the Tumen river into Chinese territory to arrest the journalists. Munhwa Ilbo newspaper reported the arrest of just one US journalist, and said the incident took place along another border river, the Yalu. The two areas are hundreds of miles apart. Both the Tumen and Yalu rivers are frequent crossing points for trade between China and North Korea. 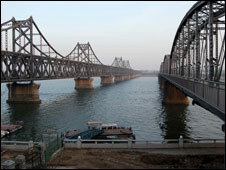 Many North Koreans also try to cross the rivers, to escape into China through the porous border - fleeing poverty and repression in their homeland, and attracted by the economic boom in China. The BBC's Michael Bristow, who has just returned from the North Korea-China border, says there is a heavy military presence in the area. There are checkpoints every few kilometres, he says, with both Chinese and North Korean soldiers visible from the river banks. In 1996, an American was arrested by the North Koreans on suspicion of spying, after swimming up the Yalu river. He was released after three months, due to the intervention of US congressman Bill Richardson. Tensions between North Korea and the international community - particularly the US - have heightened since North Korea's announcement that it will launch a communications satellite between 4 and 8 April. Analysts believe the satellite launch is actually a planned long-range missile test, and the US and its allies have called for it to be cancelled. Pyongyang recently put its military on full combat alert and shut its border with the South, leaving 400 South Korean workers in the shared Kaesong industrial zone stranded. 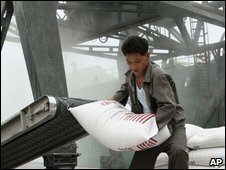 On Tuesday the US said North Korea had refused to accept any further food aid supplies, despite the fact the World Food Programme recently estimated that nine million people were in need of food assistance. Five aid groups have been told to leave the North by the end of March, the US state department said.